White paper on crime 2001 Part 1/Chap.2/Sec.5/1. Table I-27 shows the trends in the number of repeat offenders among the total number of adult and juvenile offenders cleared for penal code offenses excluding professional negligence in traffic accidents over the last decade. (See the next subsection for details of the trends concerning juvenile offenders). Table I-28 shows the trends in the percentage of previously convicted persons in all adult offenders cleared for penal code offenses excluding professional negligence in traffic accidents over the last decade, by the number of previous convictions. 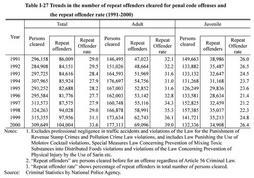 In the case of adult offenders, the proportion of repeat offenders to all offenders cleared (hereinafter referred to as "repeat offenders rate" for the purpose of this section) has been increasing since 1995,and the rate of previously convicted persons has also been on an upward trend since 1996. Among previously convicted persons, the percentage of those with only one conviction has been on an upward trend throughout the entire period, while rates of those with three convictions or more have generally been on a downward trend. 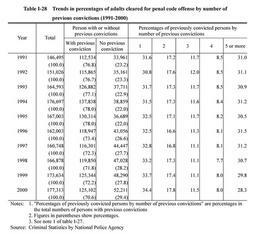 Table I-29 shows whether suspects prosecuted in 2000 had any previous convictions and their status at the time of the offense (in the course of suspended sentence, on parole or on bail) by type of offense. Among penal code offenses, those with previous conviction for Physical Violence Law violation had the highest share, followed by larceny, fraud and extortion, all of which were committed for the purpose of obtaining property. 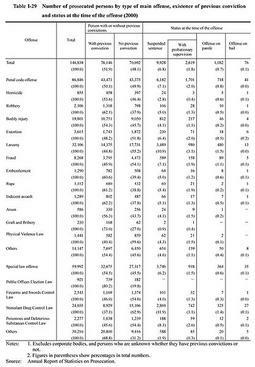 The percentage of offenses committed by those with previous convictions in all special law offenses was lower than that of all penal code offenses. However, the percentage of Stimulant Drug Control Law violations, Firearms and Swords Control Law violations and Poisonous and Deleterious Substances Control Law violations committed by those with previous convictions, was extremely high, exceeding 50% for each offense. As for offenders who were prosecuted for committing an offense while serving a suspended sentence or on parole, the percentage of larceny committed by previously convicted persons in all penal code offenses was the highest, while the percentage of Stimulant Drug Control Law violations in all special law offenses was the highest. There were very few offenders who were prosecuted for committing an offense when they were on bail with respect to all types of offenses, with the exception of 13 for larceny and 27 for Stimulant Drug Control Law violations, which were rather prominent.